A new report on chronic obstructive pulmonary disease by the British Lung Foundation criticises the lack of progress in tackling lung disease. An estimated three million people have chronic obstructive pulmonary disease (COPD) in the UK, but less than one-third are diagnosed. COPD refers to a group of lung conditions that make it difficult to empty air out of the lungs because the airways have narrowed. Two of these lung conditions are persistent bronchitis, when the airways are inflamed and narrowed, and emphysema, which causes the air sacs at the end of the airways to break down. These conditions can happen together. 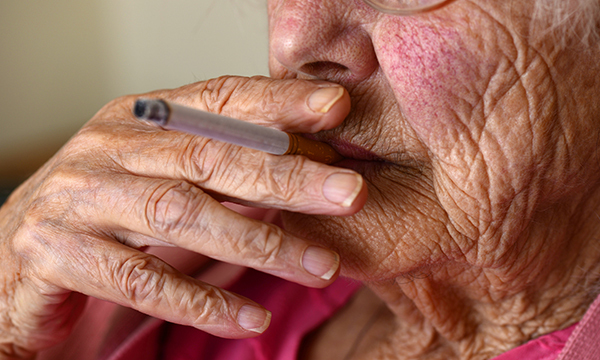 COPD costs the UK £1.9 billion a year, according to a report by the British Lung Foundation. The total costs of all respiratory illnesses were found to be £11 billion a year – £9.9 billion for the NHS and patients treated privately and £1.2 billion for the wider economy through days lost at work. The report, Estimating the Economic Burden of Respiratory Illness in the UK, criticises the lack of progress in tackling lung disease. Lung disease is the third-biggest killer in the UK and COPD is the only major cause of death that is on the increase. Symptoms include becoming short of breath easily during walking and everyday activities, a long-lasting cough, wheezing in cold weather, and producing excess sputum or phlegm. In severe COPD, patients may lose their appetite, lose weight and have swollen ankles. People aged over 35 and who are, or have been, smokers are most likely to develop the condition. Smoke from other sources, air pollution and jobs that expose people to dust, fumes and chemicals can also contribute to the disease. Consider COPD in patients with symptoms to support early diagnosis and access to treatment. Regardless of age, encourage all COPD patients who are still smoking to stop, and offer help to do so at every opportunity. All suitable patients should be offered pulmonary rehabilitation, with physical training, disease education, and nutritional, psychological and behavioural interventions. Be alert to depression or anxiety in patients with COPD. ‘While a lot of the messages around COPD can seem quite negative, there is much that can be done to help people manage their symptoms well. Breathlessness can have the biggest impact on patients, but while uncomfortable it is not dangerous. It can stop people taking any exercise, which becomes a vicious cycle and makes the symptoms worse.